HMH Books for Young Readers, 9780152050467, 40pp. Sweet little baby bunny is as cute as can be, but turn your back for just one minute and--uh-oh, he's throwing everything overboard! The peachy peaches are going overboard! Squeaky, leaky rubber ducky? He's overboard! And so are the jammies and the diapers and everything else within reach. And when it's finally time to settle down for bedtime, the baby bunny has one last surprise! 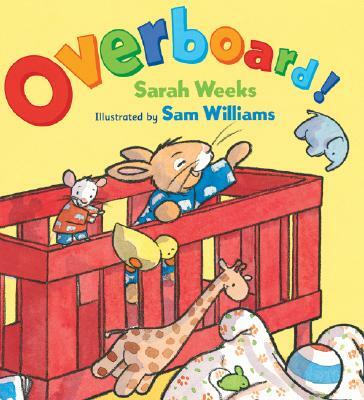 Sarah Weeks's charming rhythmic text and Sam Williams's sweet appealing illustrations have come together in a book that mischievous toddlers will want to read again and again.